Chew Design recently completed work on Artist Marie Parke’s new website. Designed to accompany her private exhibitions in and around Belfast, the design has been received well by both Marie and her clients. Work is now easier to access and preview with an easy to use interactive gallery and contact page. Marie often exhibits works in many private galleries around Belfast. She gets commisions from such exhibitions but also views her new website as a means to increasing sales and revenue in the longer term. Clients may only use the site to preview work but this gives them a taster and has them wanting more by the time the exhibition pops up. Marie has exhibited in galleries along the Ormeau and Lisburn Roads. She credits Chew Design for creating a “no fuss” website design, a website that literally allows her artworks to breathe and be shown uncluttered. This was the main issue of the brief explains Paul from Chew Design. “Marie wanted the work shown in its best possible light but with a user friendly approach. We created a site simple in design but with interactive features such as the gallery which uses a clever java script to produce full scale images of the artworks instantaneously”. 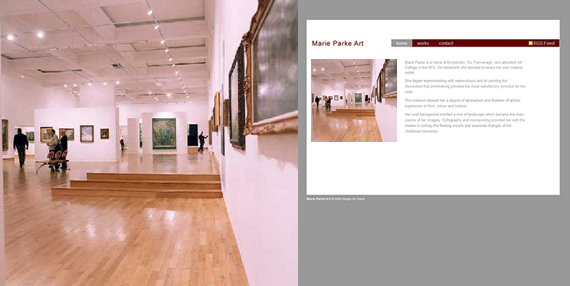 Look out for Marie Parke’s artworks in and around Belfast and visit the site for a preview.